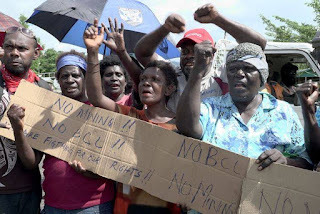 A group calling itself 'Bougainvilleans United Against Mining' has re-stated its opposition to a resumption of mining at Panguna. The government in the autonomous region of Bougainville wants the huge copper and gold mine re-opened to give the economy a lift ahead of the independence referendum to be held in 2019. Bougainville's Mining Minister Raymond Masono this week applauded a joint resolution by ex-combatants to back the re-opening, but one of those praised by the minister, a former Bougainville Revolutionary Army commander, James Onartoo, says he and his group do not support it. Mr Onartoo says their group, which includes many women, landowners and ex-combatants, will not support Panguna being re-opened, or mining anywhere on Bougainville. Members of the group joined a blockade that stopped the ABG from signing a memorandum of agreement with landowners at Panguna two months ago. Mr Onartoo says the ABG is weak and lacks the laws and systems to effectively regulate and deal with a large scale mine.